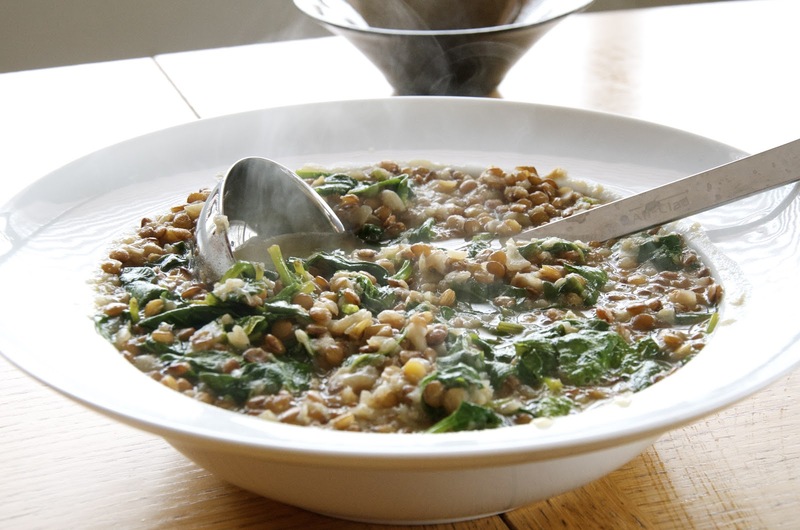 The weather is still not sure what season we are in, so I've been combining winter and spring in my cooking - more easy-to-digest soups and stews, along with the brighter leafy flavours that move into gardening season. We had a 5 day break in the winter weather that gave us great hope of spring. We went for long walks in the back 40, and now that Jim has a Fitbit too, we were in mini-competition mode to see who could log the most steps. It's easy to do when you WANT to be outside, walking. We sat at the picnic table, soaking up the warmth and sunshine while the kids jumped on the trampoline. It was so lovely. The funny thing is, I don't love lentils. I can go either way with spinach, but usually, I pretty much love it. I love lemon, I love garlic... and somehow, I just adore this soup. It is filling, only 3 WW Points per 1c serving, and it is packed with energy and nutrition. Heat olive oil and sauté onions and garlic until tender. Add water, lentils and salt. Cover and simmer for one hour. Stir in spinach, lemon zest and juice. Cover and simmer another 5 minutes or until spinach is tender. Serve on its own or with a chunk of crusty bread. It's just right. I love this recipe and have made it several times, especially with the 3 cloves of garlic!